Most of us have scant opportunity to dodge tax. Receiving salaries from our employers we are subject to Pay As You Earn (PAYE). The taxman takes his share of our earnings before we get a sniff of the money. We are never in a position to be tempted by tax advisors who see no profit in tempting us. Pretty much our only tax-dodging opportunity is paying our plumbers cash to evade VAT. Like children gazing through a toyshop window, tax dodging is something we see but can’t touch. 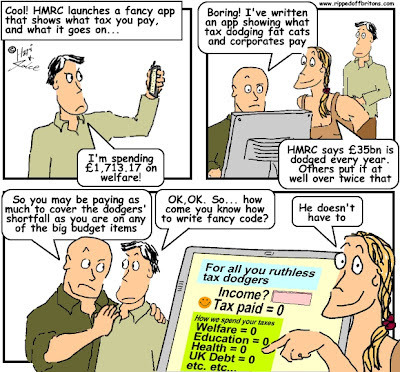 But for those whose income is not pre-strained by HMRC – businesses and businessmen, the independently wealthy living on unearned income (dividends and capital gains), freelancers and contractors on screen and in suits – temptations to avoid tax together with the tempters and temptresses who will indulge you for a fee abound. 1) The nation is deprived of much needed revenues, which are made up by increasing taxes on the rest of us (increase VAT; abolish 10% band; freeze allowances) and by cutting services (NHS; Police; Armed Forces; Education; Research) and by delaying and cancelling investment (airplanes for our aircraft carrier; transport infrastructure; schools; hospitals). 2) Much of the tax dodging is completely legal. This is characteristic of a Britain that chases the 99% of ordinary Britons mercilessly, while indulgently leaving legal loopholes for the 1% who can afford to pay for expensive advice. Loopholes that are by no means limited to tax avoidance. By far the most popular tax dodge is to simply hide your money. A former Chief Economist of McKinsey, the global consultancy firm, estimates between US$21 trillion and US$32 trillion (1 trillion = 1,000billion) is deposited in hidden bank and investment accounts. According to the Economist newspaper the UK & Channel Islands is the biggest hidey-hole of hidden cash in Europe after Switzerland. And a recent investigation by the Bureau of Investigative Journalism uncovered a sustained lobbying campaign in the UK by British dependencies such as the Cayman Islands to protect their privateer status. Say I have $100,000 in my high-street bank account that needs to go into hiding. I buy some Brit Art for $100,000 - perhaps half a glass of water, a neon light turning on and off, and a few small balls of squished blue-tac - from a dealer based in a tax haven (who therefore doesn’t have to account for the money received). Hey Presto! My high-street bank account is empty, I have an invoice to show HMRC explaining my 'expenditure', a few new consumable items for my office, and my Cayman account is replenished. Hiding money like this is sort of illegal. “Sort of” because HMRC has bent over backwards to reach agreements with havens, including Switzerland, that legitimise hidden money while keeping the dodgers’ identities hidden. More balefully fascinating than these disappearing tricks are the crude steps taken to dodge tax in full view of the taxman. It is not necessary for these dodges to be legal, they simply have to evade being illegal. Obey the letter of the law, or find the gaps. Saint Paul could have been the patron saint of tax advisors: “where there is no law there is no transgression” (Romans chapter 4, verse 15). As such, the steps of the taxation tango are designed to be circuitous and confusing. This does not imply they are elegant and sophisticated, but more brutish and short lived. Short lived because deals like this are like mayflies. They are created to be legal, they enable you to dodge tax for a year or so, they are spotted by HMRC, they are made illegal and they expire. The tax advisers then create another short lived dodge earning them another round of fees. That’s how the tax advisers keep themselves profitably employed. Tax dodges are there for a purpose: to allow the elite to dodge taxes everyone else has to pay. 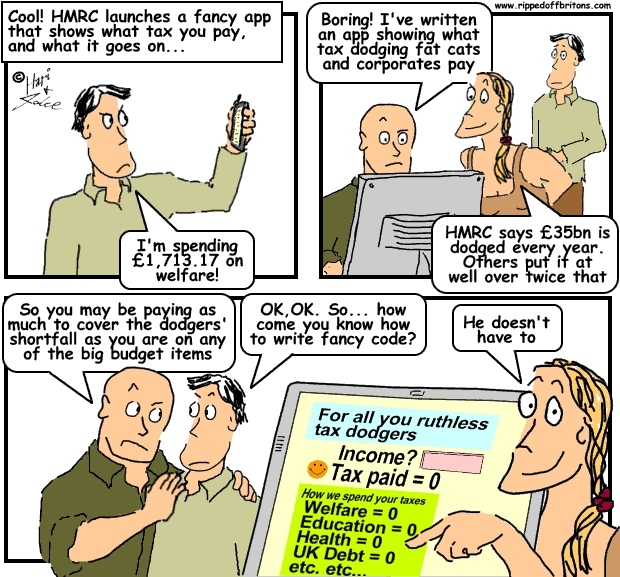 When scruffy contracting computer programmers cottoned on to setting up one-man companies to enjoy the dodges of the elite HMRC specifically introduced IR35 legislation to cut them out. You can be pretty sure it wasn’t the rich selling themselves into slavery, surrendering their freedom and their legal protections including from crucifixion (only permitted for slaves and foreigners). It would have been the last resort of the desperately poor. Gauke unintentionally (we assume) reminds us that even in the fourth century AD tax dodging by the 99% was not allowed. We at Ripped-Off Britons are compiling a list of tax dodging tactics, which will continue to grow over the months and years. We will attempt to explain how the dodges work in simple terms. The dodge: Disguise employment income as a loan. The dodge: Create a tax credit for interest paid on a loan. The benefit: In the example case, GBP117 million tax credit shared between 289 individuals (on average just over GBP 400,000 each). The dodge: Create a capital loss just before 5th April, cancelled by an equivalent profit just after 5th April. The benefit: Capital loss used to cancel out a capital gain in the earlier tax year. By becoming non-resident the capital gain in the later year is not taxable. First of all, change your references from Alan Carr to Jimmy Carr, to avoid the lawsuit which will otherwise follow (that's £500 + VAT please...). Second, the schemes you list prove precisely the opposite point to your headline. The last two have already failed in the courts/tribunal, and K2 has yet to be tested - many advisers think it will fail too. Thanks for the correction re. Alan and Jimmy - change made. And apologies to Alan. We plan to include schemes that have been sold by accountants of high repute, even if they subsequently fail in court. With the intention of highlighting what high-flying high-paid accountants believe the law does not forbid - on the presumption that their assumptions are a reasonable reflection of the elasticity of the law. and the fact that its failed in court, is a failing of the court, the point is it is immoral, everyone else pays their dues on all of their income, and so they should.